Cadwalader Park is the largest urban park in the City of Trenton (109.5 acres). It is crossed by the Delaware & Raritan (D&R) Canal State Park. Dr. Thomas Cadwalader of Philadelphia moved to Trenton from Philadelphia in 1743. He became chief Burgess there. He bought a large tract of land and set aside an area northwest of town where he built a country home, which became his residence in 1746. The most significant change to this land came between 1832 and 1834 when the feeder for the D&R canal was built to supply water from the Delaware for the canal. A bridge crossed the canal near Cadwalader’s house. Cadwalader’s property was sold off in various parcels after 1776 and in 1841, Henry McCall bought a parcel of this land that included most of the current park. McCall hired architect, John Notman, of Philadelphia to build him a house, which he called Ellarslie. It is an Italianate villa with large piazzas on the west and south side that probably were intended to take advantage of a view down the slope to the Delaware. The property also featured landscaping with specimen trees and a tree-lined entry drive, which came from West State Street and crossed the D&R feeder canal. McCall sold his property to George Farlee in 1881. Farlee subdivided some of the land across the current Stuyvesant Avenue north of the park into lots for a residential neighborhood called Hillcrest. In 1888, Farlee put the remaining 80 acres, including Ellarslie and a number of outbuildings up for sale. The City of Trenton was looking for land for a park and acquired the property for $50,000. The property was transferred to the City on May 22, 1888. Five days after the City voted to purchase the estate and well before the Farlee family had a chance to pack up their belongings, thousands of Trentonians showed up to inspect their new park. This is particularly impressive when one considers that many of them walked there from downtown Trenton. For those who could afford the fare, Trenton had horse-drawn streetcars that ran on Spring Street as far as Prospect, but its riders had to hike the rest of the way. In 1892, the horse-car line was extended from Prospect Street out West State Street to the Park. On July 4, of that year, an astonishing 12,000 people visited the newly accessible Park. When the first electric trolley car made the trip two years later, it was greeted with cheers and fireworks. Discussions among Hill and other Trenton civic leaders led to the engagement of Frederick Law Olmsted’s firm to design a park in 1890. Olmsted was the premier park designer in the United States and is best known as the designer, with Calvert Vaux, of Central Park in New York City. 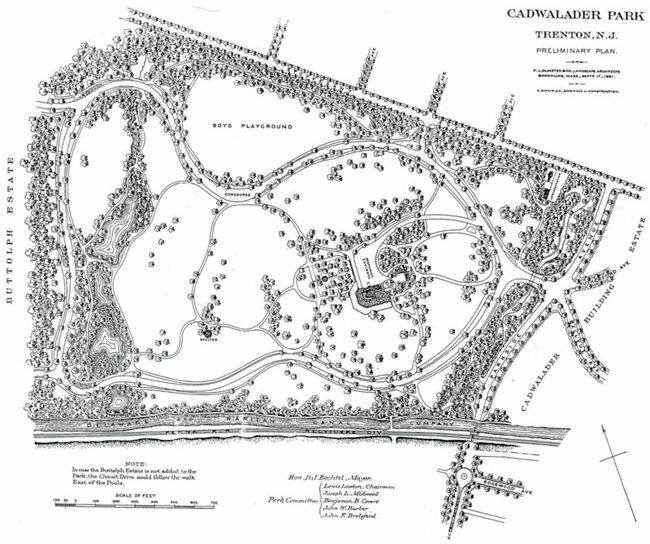 For Cadwalader Park, Olmsted prepared plans for pedestrian paths and carriage drives by which the scenery of the park could be enjoyed, the location and type of vegetation and trees, and lawns and groves surrounding the Ellarslie mansion located in the heart of the park. Ellarslie formed a central element of the plan. Olmsted wanted to turn the mansion into a restaurant for park patrons and add a large vine-covered trellis next to the building. He created an approach to the mansion from the new entrance to the park on Parkside Ave. The park plan also featured a concert grove – a meadow designed for both carriages and pedestrians to attend concerts in a bandshell. 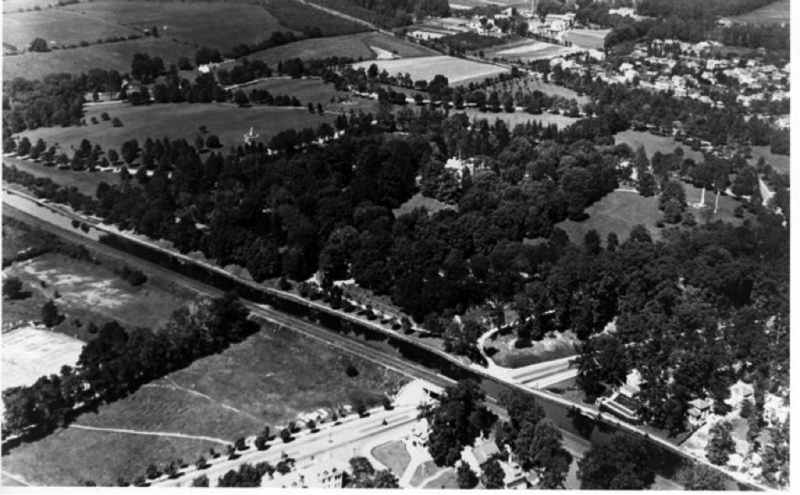 The ravine just west of Parkside Avenue, where Olmsted sited the new main entrance to the park, received a large amount of attention during the early years of the park. This was one of the areas that Olmsted urged the city to acquire in order to fill out the park boundaries beyond the property acquired from George Farlee in 1888. Construction of the park with Olmsted’s guidance began soon after he received the commission on May 2, 1890. He and his son, John C. Olmsted, were at the park as early as May 21, and offered suggestions that were soon incorporated into working drawings. On May 31, for instance, the park engineer E.G. Weir completed a new “detail engineer map” that incorporated a number of Olmsted’s suggestions and was, according to Edmund Hill, “more practical, has truer grades, reduces excavation, and is far better” than the previous plan drawn up by a local engineer. In mid-September, John C. Olmsted came to Trenton to present the first preliminary plan, which the common council promptly adopted. During the years of park construction when Olmsted and his firm were closely involved in the process, work on the circulation system progressed rapidly. Olmsted designed the entrance to the park on Parkside Avenue with a bridge over the stream and the “rustic stone parapet” along the eastern ravine. The entrance was completed in 1891. 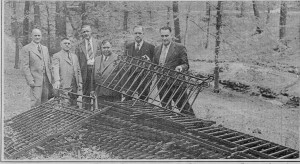 On the western side another ravine with a series of pools was planned to be constructed on the land across the street from where Cadwalader Drive is today but this property was never acquired for the park. The northwest corner of the park with the ball fields and a large pond was not developed until the acquisition of the land in 1926. In 1892, a new city administration opposed to expenditures for parks came into power and Olmsted’s involvement ceased until 1910. It was during this time that the deer paddock was constructed (against Olmsted’s wishes) on the western side of the park (the barns were constructed in 1913), a statute of George Washington was placed in the Park (later moved to Mill Hill Park), a statue of John Roebling was commissioned and erected and a cage for the bear and a tall rustic observatory were also built. The 1906 Annual Report of the City of Trenton contains, as part of the Park Commission’s Report, a list of the animals in the Park menagerie. 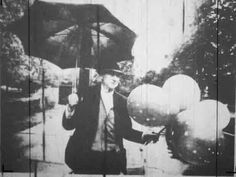 At one point, the Cadwalader Park zoo even boasted a lion, but the roaring kept nearby residents awake at night and the lion had to go. Special mention should be made of the Cadwalader Park bears. The park’s first black bear, named Kitty Hill in honor of Edmund Hill, was young but committed to freedom. As soon as she arrived at the train station on Clinton Avenue, Kitty broke out of her crate and ran amok in Mercer Cemetery. She was recaptured and placed in a barn in the park, but she soon escaped again. She was last spotted in the woods near Lambertville, but was never recaptured. The Park’s last bear, Briar Patch, is believed to have lived longer in captivity than any other black bear. Briar Patch died in 1983 and is buried just behind the bear pit. See some postcard images of the park’s early days courtesy of the Trenton Historical Society website. Olmsted’s firm did have some continued involvement with the development of the park below the Canal from 1910-1911 but many parts of the plan were never implemented. The original entrance to the Park was a tree-lined path, known as Lover’s Lane, that ran from West State Street up a sloping hill to the D&R Canal feeder. At the top of the Lover’s Lane, park visitors had to dash across the tracks of the Belvidere Division of the Pennsylvania Railroad and then cross a small bridge over the Canal Feeder to enter the Park. The City recognized the dangers of this situation and in 1910 a tunnel was built under the canal and Parkside Avenue was extended to State Street. The 1910 tunnel under the Canal feeder is still in use today. In 1925, the bridge over the D&R canal was removed and the Parkside entrance became the main entrance of the park. In the photo above, Lover’s Lane is still visible as the tree-lined road on the lower-left side of the picture. The railroad tracks can be seen along the south side of the Canal but the bridge is no longer there. The Parkside Avenue tunnel is also partly visible in the lower-right corner of the photo. Ballfields, tennis courts and basketball courts were built on either side of Lover’s Lane in 1967. A new bridge was built across the Canal Feeder in 1982 to connect Cadwalader Park to the D&R Greenway State Park that replaced the railroad tracks. The original gazebo built for concerts under Olmsted was replaced in 1913 with a more substantial traditional band shell structure. The exterior of the band shell was white and the domed backdrop was painted sky blue. It served as the all-purpose stage for weekly concerts and countless events and ceremonies in the park. 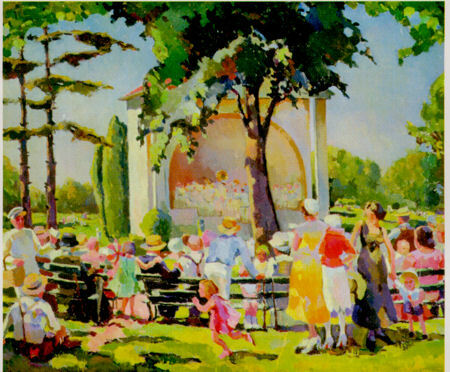 The painting above, Sunday Concert in Cadwalader Park, painted in 1931, is one of the finest oils by Graham Holmes. The artist was the son of Frank Graham Holmes, Sr., who headed the art department at Lenox China for almost 50 years. The artist’s son donated the painting to the museum in 1995. It was recently cleaned and restored and can now be viewed in the museum on the landing half-way up the grand staircase. The band shell burned down in 1967 during an unintentionally spectacular production of Snow White and the Seven Dwarfs. 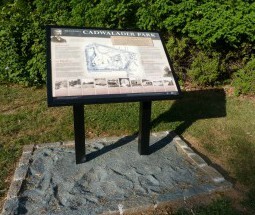 Growing up in Trenton has long included memories of the playground in Cadwalader Park. 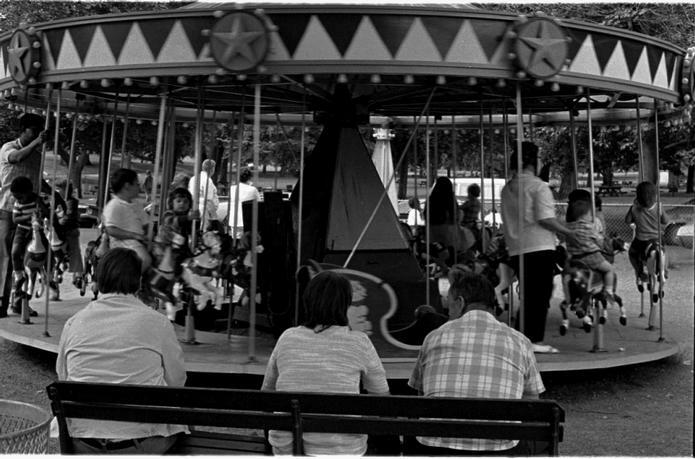 In its early years, the playground featured a merry-go-round, swings and pony rides. Later, the Horan family held the concession for rides in the playground for more than 30 years. For 15 cents a ride or four for 50 cents, kids lined up to ride the airplane swings, the Kiddie Whirl, the fire engines or the merry-go-round. The lower floors of Ellarslie were converted into a monkey house in a Works Project Administration (WPA) project in 1936. The construction of the large pond in the northwest corner of the park was also a WPA project. The park’s cast iron perimeter fence was taken down to be used for scrap iron in WWII. The City Commission rejected a request to also take the four cannons then located around the Soldiers and Sailors Monument after veterans groups objected. Instead, 30 to 40 “abandoned light posts” from Stacy Park above Calhoun Street were substituted for the cannons. The park remained popular with city residents after World War II but by the 1970s lack of maintenance had caused the condition of the park to deteriorate. In 1971, the City began a project to convert Ellarslie from a monkey house to the Trenton City Museum. 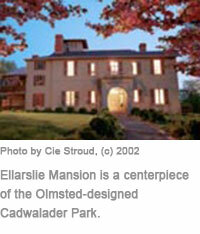 Ellarslie and Cadwalader Park were placed on the National Register of Historic Places in 1973. The Museum opened in 1978. Here is a link to a You Tube video from the WZBN “Moments in History” series with historical footage of the park. It is narrated by Trenton history maven, Charlie Webster. In 2008 and 2009, the deer and domesticated ducks were removed from the Park. The deer paddock area had become severely eroded. The animals polluted the stream, which drains into the Delaware River. In 2014, a four-year effort was completed to restore the area to a meadow and wetlands. The $100,000 project was a collaboration between D&R Greenway, the city of Trenton, and Isles Inc, a local nonprofit. The grant funding was secured from the New Jersey Department of Environmental Protection, the National Fish and Wildlife Foundation and the Corporate Wetlands Restoration Partnership. Several large corporations, including PSE&G, also donated funds. 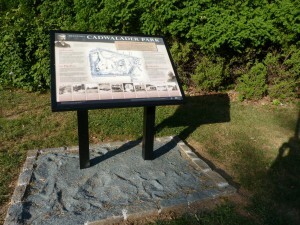 In September, 2015, five “wayfinding” signs covering the history and development of the park and the feeder canal were installed in the park. 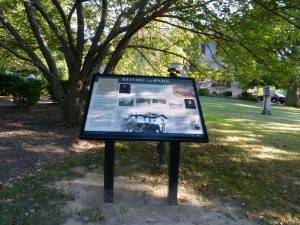 The signs were designed by Hunter Research and were paid for by a grant to the Cadwalader Park Alliance from the Garden State Historic Preservation Trust Fund, which is administered by the New Jersey Historic Trust. A sixth wayfinding sign was installed near the canal in 2017. Much of the information on this page is taken from the Cadwalader Park Master Plan, which was developed and adopted by the City of Trenton in 1998 (but only partly implemented), from the 2002 city publication, A Celebration of Cadwalader Park and from various Time and Again columns by Sally Lane in the Trenton Times.